A Cardboard Problem: Would you buy umpire cards? Apparently, umpires for soccer are so popular in Australia that they are coming out with their own trading card set. It's a set of 72 cards featuring field goal and boundary judges. "Now the cards are pretty well accepted and we get a lot of interest from the umpiring fraternity," Deller told The Herald Sun in Australia. "Interest is particularly from young umpires because a lot of them look up to the league blokes and they are keen to get their collections going." And, it's the fourth release of this set. Not everyone agrees this is such a good idea because it will fuel the umpire's egos. It begs the question: Do you want a trading card of Jeff Kellogg or Tim Tschida? You can get pictures of them in a very animated strikeout call or going belly-to-belly in an argument. Here are some pictures one of the card companies could consider using for the umpire. After all, they don't get much notice because they are photoshopped out of MLB trading cards. Back in 88, 89 and 90 a company (I believe it was T&M) produced sets of baseball umpire cards. I remember I got Dale Scott, Jim Joyce and someone else signed cause they were from Oregon. I saw sets of them on ebay now. Is that Cowboy Joe West in the 2nd to last photo? It looks like he's getting down and doing for Jerry Manuel. My dad has a set of umpire cards I remember seeing when I was younger. Today, no, I don't think I'd buy a pack of umpires, but it wouldn't be the strangest thing to come wrapped in wax, would it?! I would collect them as part of a set (like 1955 Bowman), but I wouldn't buy them separately. 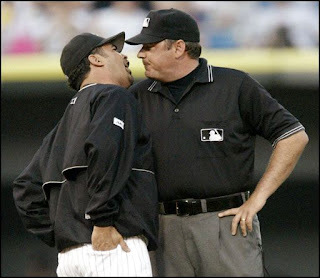 But if I ended up with a card of Joe West or Angel Hernandez, I'd be awfully tempted to burn it. Aussie Rules Football does though. I've already voiced my opinion on scouts being on cards (and one scout didn't like it very much). I feel the same way about umpires. It's not why I collect cards. I have one of those umpire cards from 2004 Bowman Heritage that mimicked the 1955 Bowman set, which apparently also had umps in the set. I still don't know what to do with that ump card. If I got an umpire card in a pack, it better have Leslie Neilson on it from the Naked Gun. That would be fun. 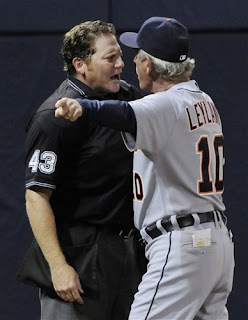 A couple of inserts of umpires would be annoying, but funny if they were all cards with a manager in their face. It's been a long day, but am I the only one who got a kick out of this quote? "Interest is particularly from young umpires because a lot of them look up to the league blokes and they are keen to get their collections going." We do not use the word keen nearly enough here in the US. A 1955 Bowman umpire, sure. Everything else, not so much. Topps included an Eric Gregg card in one of their Dan favorites type sets a few years ago. Not an action shot but it used the 1978 set design so I kept it. Like Greg though, I don't know what to do with it. I would LOVE an umpire set. It could be a short printed autograph set, with some great action shots of umps throwing out a player, or ripping the cord on a called third strike. Maybe that could be a sportflics card. Umps get no love for the job they do. This would be cool indeed. 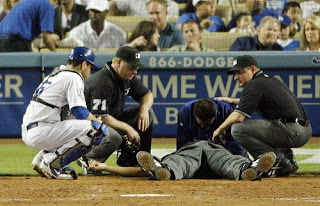 I would like to have umpires (and broadcasters, too) as part of a set with retired or current players, but I would never buy them as a stand-alone set. I think the perfect set would be Fan Favorites if Topps would ever bring that back.